The most rational pickup in the Lone Star State. “Less than three percent of midsize truck buyers will ever tow.” Verified by way of a third-party survey and covering the whole of the now five-model-deep pickup segment, this data throws cold water on the traditional notion of how truck owners use their trucks. Oh, and Honda engineers said it right before I belted myself in for the towing demonstration of the all-new 2017 Ridgeline. If you’re a neophyte in the world of pickup trucks, don’t search for a thread of logic with which to explain the midsize segment. 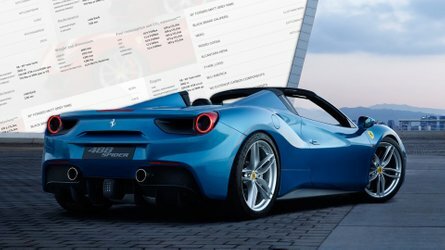 The vehicles sold here are a stewing combination of contradiction, unused ability, conservative buyers, and innovative engineering. 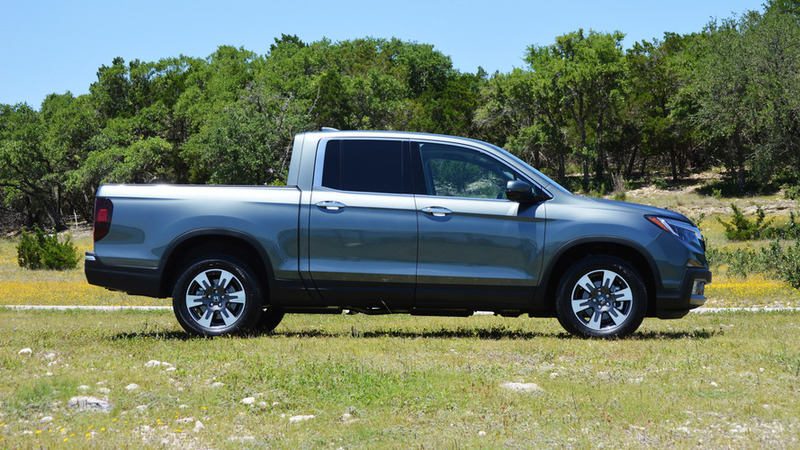 Oh, and the new Ridgeline is absolutely the top of the class... if you’re grading the class rationally. There’s a little-known clause in the U.S. constitution that says all new truck launches must take place in Texas. So I traveled to San Antonio to drive the Ridgeline in the long shadow of the Alamo, and in view of the most entrenched truck owners in the world. Honda’s messaging was consistent, if unsubtle, that its new pickup has been designed to do just about everything that truck owners say they want to do with their vehicles, even though it’s been engineered to do so in a way that best accommodates how they actually drive them everyday. Doing so in plain site of real Texans made the goings-on that much more convincing, then. Honda’s design is still far sleeker, less-truck-like than the current Tacoma, Chevy Colorado, or GMC Canyon, but it’s no longer unattractive. Does all of that sound a bit familiar? 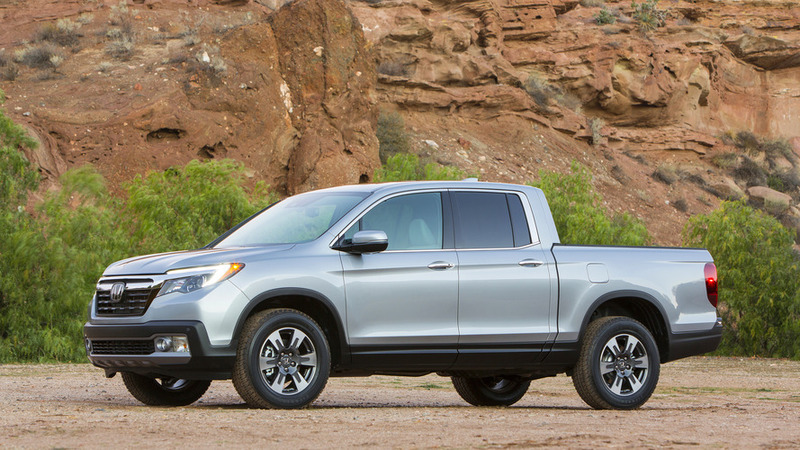 If so, you’ve probably heard of Honda’s first-generation Ridgeline: the very rationally constructed and innovative truck that debuted in 2006, shook up the segment, and was quietly crushed by the Toyota Tacoma until 2014. (Calendar year 2006 saw Honda sell about 50k Ridgelines, its best-ever performance; Toyota sold 170k Tacomas in the same span.) 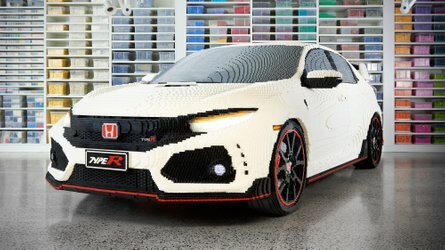 Then, as now, Honda had a better product in most measurable ways. 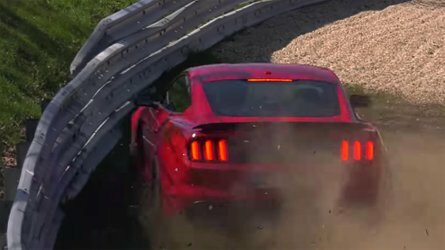 But the 2017 model has learned some important lessons, specifically in the styling department. One of the ‘problems’ with the old Ridgeline was that it simply didn’t look very much like what we’ve come to expect from a pickup. That has mostly been addressed for this new truck, which has a far more standard-looking profile; a more aggressive, rear-up stance; and less-fussy bodywork. The biggest difference is where the bed meets the cab in an age-tested right angle, shedding the goofy, sweeping C pillar of the old version. Honda’s design is still far sleeker, less-truck-like than the current Tacoma, Chevy Colorado, or GMC Canyon, but it’s no longer unattractive. In fact, while shooting some photos in the driveway of a handy ranch, an honest-to-god Texas truck-driver (and presumably the ranch’s owner) stopped to talk with me about the Ridgeline from the cab of his Ford F-250. He thought the Honda looked “sharp,” though did ask if “they’re going to make it in a three-quarter ton?” Not any time soon, by my guess. Still, this is progress. The Ridgeline completely annihilates the competition in terms of noise, vibration, and harshness, as well as compliant ride quality. 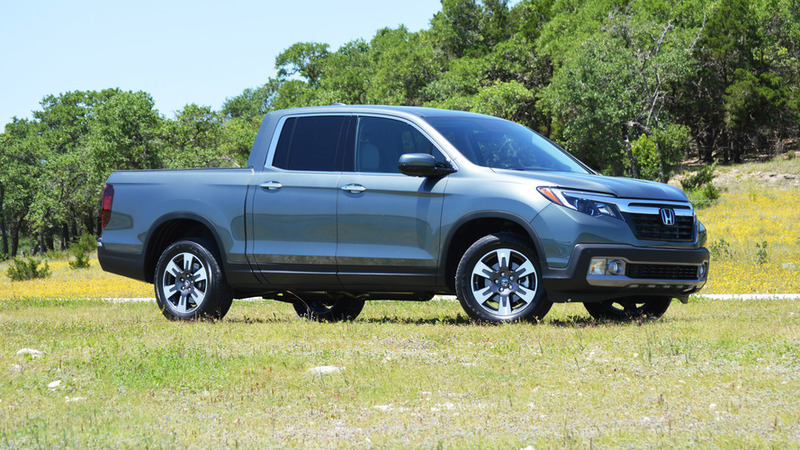 Despite its more conventional appearance, there’s very little convention in the way the Ridgeline goes down the road, at least when comparing it to other trucks. When Chevy debuted the all-new Colorado in the 2015 model year, I figured it as one of the very quietest, best riding trucks I’d driven. But the fact is that the Ridgeline completely annihilates the competition in terms of noise, vibration, and harshness, as well as compliant ride quality. 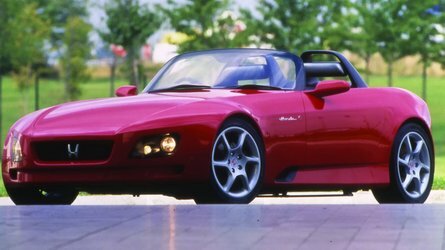 At highway speeds of 70 miles per hour and above there’s some wind noise from the large side mirrors, but engine noise is reduced to all but a distant hum. It really takes digging deeply into the throttle before the exhaust note from the 3.5-liter V6 engine is audible, let alone abrasive. Far more than the competition, this is a pickup that will make a commuter’s life very comfortable. The powertrain is also well adapted for folks that may be more used to driving a sedan or a small crossover than a truck. Throttle response from the 280-horsepower, 262-pound-feet engine is smooth and assertive, thanks in no small part to great initial gearing from the six-speed automatic transmission. That’s less power and torque than you’ll get from Chevy or GMC, but the Honda feels a hair quicker when comparing V6 applications, and sounds far more refined in action. With estimated fuel economy sitting at ratings of 18 city, 25 highway, and 21 combined (for the 4x4 truck), Ridgeline has better fuel economy than a comparable Colorado and Tacoma, too (but not better than the Colorado diesel). Honda’s in-bed, lockable trunk sticks around, as does the dual-action tailgate. 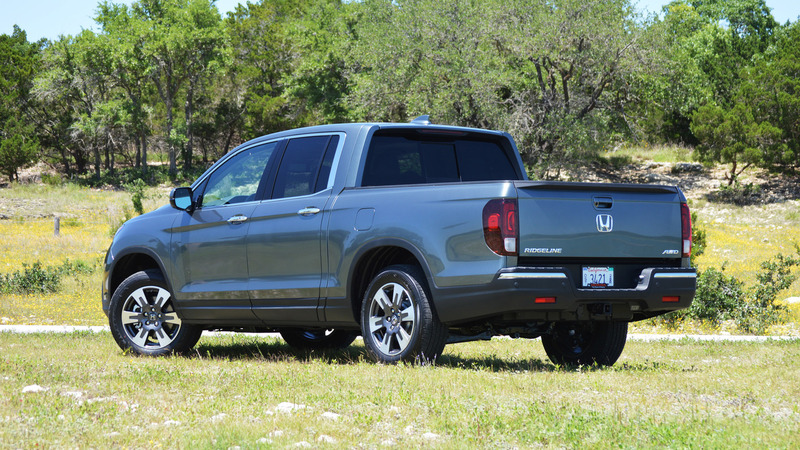 The competent and car-like driving experience extends to handling, too, at least for the all-wheels-driven Ridgeline (this time around Honda will also offer a two-wheel-drive version of the truck, but didn’t have one on hand at the launch). Steering response is good for the class, with a quicker ratio than the outgoing truck. Moreover, Honda has engineered a torque-vectoring differential that can transmit power front to rear and side to side (in the back). The net in normal driving is reasonably confident cornering, even at a good clip. 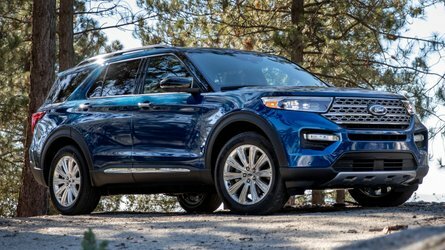 It doesn’t feel much like a “front-drive” experience, even though it’s based on front-wheel-drive architecture, which is a pleasant surprise. On some improvised dirt- and grass-track handling courses, the system proved great at catching the rear-end mid corner, and allowing impressive grip under duress. More importantly, if future owners do find themselves in low-grip situations, the truck seemed quite happy to climb up muddy hillsides, charge through sand and the like. There’s no low range, but extra-suburban adventures will be in reach. To reiterate: this is how people actually use midsize trucks. 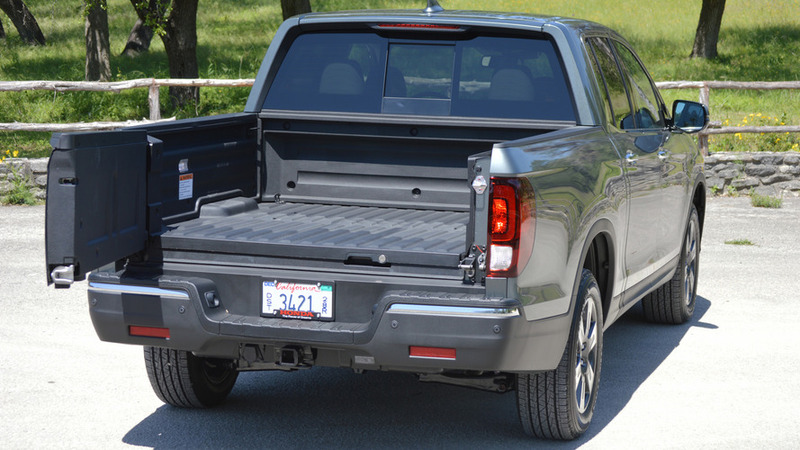 The first-gen Ridgeline offered practical storage innovations that the new truck carries forward. In addition to being pretty roomy, the rear seats flip up to reveal sizable storage compartments. More notably, Honda’s in-bed, lockable trunk sticks around, as does the dual-action tailgate (it opens down, and to the side) to offer easy access to that trunk. Cargo capacity inside the trunk measures out to 7.3 cubic-feet, which is more than enough for my standard grocery store run. I call a toss-up between the Honda and the nicest version of the GMC Canyon in terms of segment-leading cabins. Forget about groceries, though; the in-bed trunk is just one of many features that could make the Ridgeline the ultimate party wagon. For starters, the trunk has a drain plug so it can easily be used to store ice, and chill beverages. Second, Honda figured out a way to turn the entirety of the Ridgeline bed into one big speaker. Rather than fuss around with installing weatherproof speakers somewhere, the Honda fitted six “exciters” (think about the moving part of a speaker cone) to the side panels of the bed. Those units are strong enough to turn the panels themselves into resonators by vibrating the bed, which in turn allows for a really slick, tailgate-approved speaker system. Now, the fidelity of this setup isn’t exactly flawless – it especially lacks any bass punch – but it’ll work just fine for the beach. From the driver’s seat (or that roomy rear seat), I call a toss-up between the Honda and the nicest version of the GMC Canyon in terms of segment-leading cabins. Ridgeline materials and fit and finish seem of a higher standard, but the design overall is slightly bland. 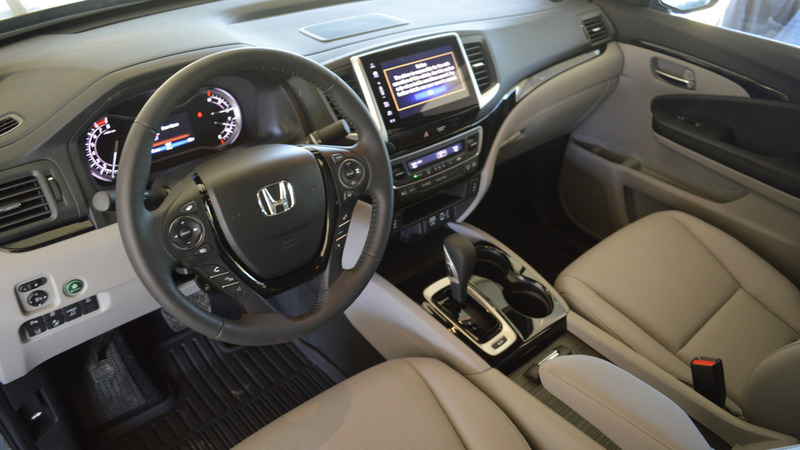 Both products offer a really nice, flashy touchscreen headunit with good software, though I’ve always found MyLink a smidge more user friendly than HondaLink – I’ve also used the GM system more, so your mileage may vary. This is a lifestyle market more than a working vehicle market, and the dictates of lifestyle are far from rational. 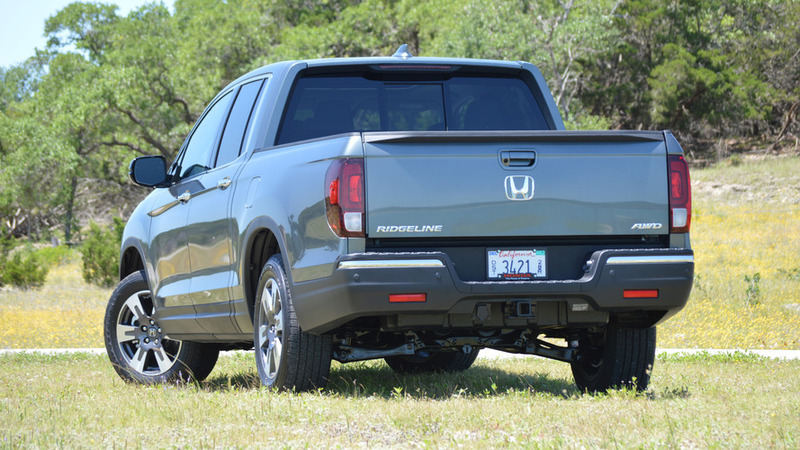 The 2017 Honda Ridgeline feels, and drives, and looks less like a truck than its main competitors. The Honda folks that designed and built it will tell you those are all positive statements, because “like a truck” is also shorthand for “rough” or “uncivilized.” I think they’re right. But, in the same way that I still occasionally like gas station coffee even though I know pour-over ultimately tastes better, lots and lots of truck owners may find the Ridgeline a little off-putting. Too smooth, too quiet, too much like a car. That’s not a condemnation of Honda’s strategy so much as a resignation that, when you really stop to think about it, buying a truck hardly ever makes rational sense for people buying midsize pickups. 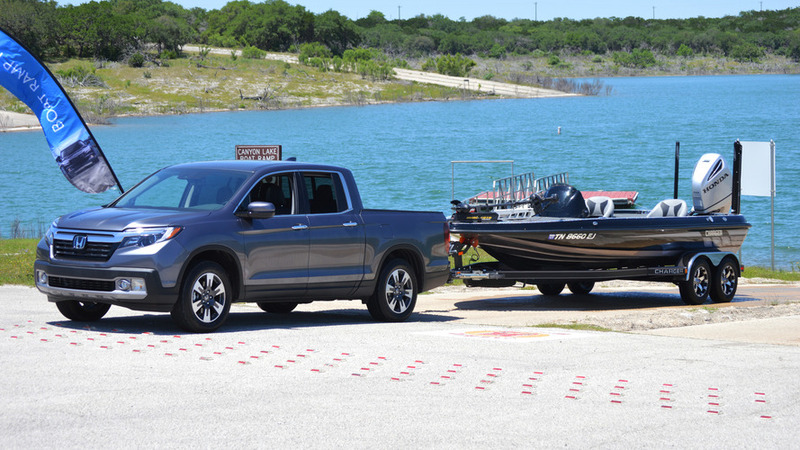 Three-percent of these folks ever tow anything – does it matter then that the Ridgeline can tow a respectable (but far from segment-leading) 5,000 pounds with relative ease? Does it matter that the payload figure of 1,584 pounds is impressive? This is a lifestyle market more than a working vehicle market, and the dictates of lifestyle are far from rational. More than 50,000 people per year found the rational-small-truck argument compelling enough to buy a Ridgeline at its peak. With competitive pricing – MSRP ranges from $29,475 up to $42,870, which more or less matches the segment for V6, AWD versions – Honda should easily surpass that once production ramps up and the vehicle goes on sale, this June. Traditionalism will dictate that the Ridgeline will not become the new sales leader, I’d wager. But I bet you’ll see more than a handful of owners happily not caring about unit sales, even in Texas.